Marvel and Netflix’s Daredevil owes as much to the work of Christopher Nolan as it does to the larger Marvel Cinematic Universe. Taking advantage of the change in platform and format, the thirteen-episode season is a bit rougher and meaner than most of Marvel’s recent output. The show never reaches the excesses of The Punisher or Punisher: War Zone, but the show has a much rougher edge to it than many of its contemporaries. It is very much grounded in an urban noir storytelling style. With thirteen episodes released to stream simultaneously, Daredevil is a unique venture for a studio that has been experiment in different media and different delivery methods. Daredevil is much more cohesive than either Agents of S.H.I.E.L.D. and Peggy Carter, feeling much more like its own thing. While each of the thirteen episodes is structured as an episode in its own right, the whole season amounts to a single long-form story. Distilled to its essence, Daredevil is the story of the conflict between an emergent vigilante and an ascendant crime lord. The series is not flawless; there are some pacing and structural issues that do haunt the series. However, it is a bold piece of work that stands unique among the prolific output from Marvel Studios. It is hard to imagine that either Avengers: Age of Ultron or Ant-Man will feel anything like this more grounded adventure, giving Daredevil a distinctive texture and demonstrating that Marvel is willing to experiment with the tone and style of some of its product. Given the volume of the studio’s output, this is inherently a good thing. Daredevil is anchored in a set of terrific central performances and a clear sense of purpose. It might lose focus at points, or stumble into some plotting or pacing issues, but it marks a high point in Marvel’s television output. In some respects, it feels like Daredevil owes a heavy debt to Christopher Nolan’s Batman Begins. After all, it tells the story of an urban vigilante motivated by childhood trauma to make his home a better place. There are all manner of visual and thematic reference to Batman Begins to be found in Daredevil. The second scene of the series is set at an illegal activity on the city docks, announcing the arrival of Daredevil in the same way that Nolan announced the arrival of Batman. There are other structural similarities as well. Like Batman Begins, the first season of Daredevil opts for a non-linear approach to the origin of its central character. Early on, we are treated to the scene of Jack Murdock tending to his son after a trauma that will shape the young boy’s heroic career. The first season stretches these flashbacks and insights through the season, particularly in episodes like Cut Man, Stick, Shadows in the Glass and Nelson v. Murdock. The result is to create the impression that Daredevil is not fully formed until the climax of the show. In fact, the mid-season episode Stick seems to acknowledge these similarities. The plot sees a secretive cult of ninjas who have infiltrated organised crime in the city smuggling a deadly superweapon into the city via the port. Stick ultimately plays out rather differently than the climax of Batman Begins, but it still feels like a very overt similarity. It is hard to believe that showrunners Drew Goddard and Steven DeKnight were unaware of the overlap when mapping out the season. That said, the similarities make a great deal of sense; it is often stated that Daredevil is Marvel’s answer to Batman. Both are brooding anti-heroes who are notorious for their honed athletic abilities and brooding skills. Both characters were largely redefined by Frank Miller during the eighties. Daredevil itself acknowledges this comparison in a number of ways. “Have you got a job to go to, or are you one of those billionaire playboys I’m always hearing about?” Claire asks Matt at the start of World on Fire. In Shadows in the Glass, Foggy compares Matt to a bat. This similarity is not a bad thing in and of itself. After all, it makes sense for Daredevil to have a different texture than Thor or Captain America. On the other hand, it is worth questioning whether Batman Begins really needs to be extended over thirteen episodes. In many ways, Batman Begins is the lightest of Nolan’s Batman trilogy. It is, after all, the shortest of the three films. The first season of Daredevil can feel a little extended and padded in places – particularly in its opening act. This is perhaps the biggest problem with the first season of Daredevil. The character is one of the most compelling characters in the Marvel stable, but nobody is particularly interested in the character’s origin. The first season of Daredevil borrows quite a number of cues from Frank Miller and John Romita Jr.’s origin story The Man Without Fear, but there is a reason that nobody treats The Man Without Fear as the definitive Daredevil story; it is not even the definitive Frank Miller Daredevil story. Perhaps more than any other comic book character Daredevil is a character defined by events and characterisation that take place long after his origin. In many respects, Stan Lee and Bill Everett created Daredevil as a lighter and funner version of Spider-Man – a red-clad hero who swings through New York, but without the angst surrounding Uncle Ben. For better or worse, the character of Daredevil is largely shaped and defined by stories told much later. In particular, Frank Miller’s Born Again is rightly regarded as the touchstone for the character. It is Born Again that has inspired decades of stories told about Daredevil. Brian Michael Bendis and Ed Brubaker framed their runs in the fallout from Born Again, almost twenty years after the story was first told. Even Mark Waid’s more recent and upbeat reimagining of the character is defined by its contrast to decades of storytelling that were shaped and moulded by reference to Born Again. There is a certain sense that devoting thirteen episodes to the origin of Daredevil is perhaps simply setting the stage for more interesting stories down the line. Ultimately, Elektra never materialises, despite these dialogue hints that would seem to point towards her. (It seems that Nobu is referring to himself; modesty being a virtue and all.) In fact, the entire episode Stick is structured as a piece of foreshadowing of events yet to come. Nobu seems to be named in reference to Kagenobu Yoshioka, the founder of the Hand in Marvel continuity. His plan for space within the city, and the implication of demonic activity seem to be pointing towards the comic book story Shadowland, which saw the Hand annexing part of Hell’s Kitchen. So there are points in the first season that do feel like they are stalling – as if the series is forcing its hero to level-grind his way through a stock origin. In particular, an early plot that sees Matt dismantling the Russian mob feels like a plot that is stalling for time; a place-holder origin element that exists so that the show can move all of its pieces into play. The first four episodes feel like they don’t advance the material plot that far, even as they introduce characters and elements that develop and pay off further down the line. This might be an issue with production problems behind the scenes. Drew Goddard was the writer who developed the show originally, but was poached by Sony to work on their Sinister Six project mid-way through production. As a result, the first two episodes of the season were written by Goddard before the show was handed over to Steven DeKnight, who largely drove the rest of the year. It seems like there are some minor teething problems during the handover process, with Goddard and DeKnight having subtly different approaches to the material. Goddard’s two scripts stress the idea of Matt Murdock as a man who fails, but who recovers. Talking about his father in Into the Ring, Matt reflects, “He could take a punch. Jesus, he could take a punch.” He observes, “Never got knocked out, my dad. He got knocked down, but he always got back up.” This perhaps defines Daredevil as a comic book character; the central character arc of Born Again is the idea that Matt Murdock can pick himself up after any trauma and whip himself into shape; he might not be the sturdiest of heroes, but he will find his way eventually. In a way, this is very much in keeping with the sense that Daredevil is building on a lot of what made Batman Begins work so well. Goddard offers his own twist on Thomas Wayne’s “why do we fall?” question, suggesting that Matt Murdock is a hero who is defined by his ability to recover from his mistakes; an approach that perhaps explains why Daredevil is more suited to a long-form television story than somebody like Iron Man or Thor. Well, that and the fact that he can be realised on a tighter budget. In contrast, DeKnight seems more focused on the idea of Matt Murdock as a man questioning his own heroism. DeKnight gets a lot of mileage out of comparing and contrasting Matt Murdock and Wilson Fisk. Both Murdock and Fisk had traumatic childhoods shaped by the death of a father; both Murdock and Fisk are involved with rival mystical forces at work in the world; both Murdock and Fisk seek to change New York. Indeed, the similarities run pretty deep – both even had their fathers offer them their first alcoholic beverages. It is repeated suggested that Matt might not be the most healthy of heroic types. His character flaws run somewhat deeper than Thor’s occasionally pride or Tony Stark’s recklessness. Matt is perhaps an inherently violent man. In Nelson v. Murdock, Matt tells Foggy about the incident that inspired him to vigilante justice. He tells the story about an abusive father who hurt his daughter with impunity. “The law couldn’t help that little girl,” Matt explains, “but I could.” And that, Matt claims, is his superhero origin story. The show repeatedly asks whether Matt actually enjoys the brutality and violence that comes with the work that he does. He suggests it to a goon in Cut Man, but Claire dismisses it as bluster. However, she comes to question that assessment in later episodes. Matt wrestles with that violence for the rest of the show. In fact, his opening beat-down on Turk in Into the Ring is visually contrasted with Wilson Fisk’s assault on him in Speak of the Devil. There is a sense that both Fisk and Murdock harbour deep wounds. Time and time again, Daredevil draws attention to the scars on its primary characters. Matt spends most of the series looking like a human pin-cushion and offering a variety of half-hearted excuses. Characters get bruised and battered and scarred; Claire and Karen are almost killed, while both refuse to let those assaults define and shape them. Appropriately enough, given its lead character, the thirteen episode season of Daredevil could be read as a story about trauma and its consequences. As such, it seems perfectly reasonable that Daredevil should be considerably more visceral than much of Marvel’s output. Bones snap and twist and break over the course of the show’s thirteen-episode run. Rabbit in a Snowstorm is a particularly brutal piece of television, featuring a bone protruding from the skin and a blunt impalement. Daredevil doesn’t pull any punches, taking advantage of its unique delivery platform to offer a more violent and more bloody superhero story. The stunt work on the series is impressive, particularly a long single-take sequence at the very end of Cut Man. In keeping with the themes about getting back up again, all of the characters involved in the fight refuse to stay on the ground; there are no one-hit knock-outs here, with both Daredevil and his targets often swinging blindly and barely standing straight as they try to take one another down. It is a remarkable accomplishment, and one that speaks to the skill of everybody involved in the show. At the same time, there are some technical limitations. Perhaps owing to the show’s budget, we are not allowed to get too deep into the head of Matt Murdock. 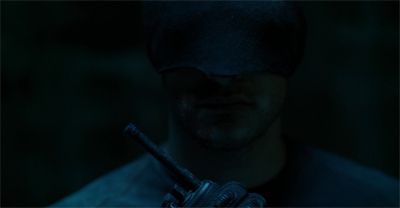 Matt’s gifts mean that he perceives the world in a unique way; all too often, Daredevil conveys this by amping up the ambient sound and offering a blurred close-up of Charlie Cox’s ear. We only really get a true sense of how Matt perceives the world in World on Fire, where he uses the episode title to describe how he experiences everything. We also get a quick glimpse of what it “looks” like. Still, this is not too serious a problem. Charlie Cox does great work as Matt Murdock. He presents a charming and likable character, but one with no small sense of arrogance and hubris. Daredevil does take advantage of its extended structure to flesh out and develop its lead character. While Cox doesn’t necessarily have the same raw charisma as Robert Downey Jr., he does help to make Matthew Murdock one of the most fleshed out lead characters in the Marvel Universe. Cox is assisted by a (largely) wonderful ensemble. Vincent D’Onofrio offers a version of Wilson Fisk which stands quite apart from that presented by Michael Clarke Duncan in the 2003 cinematic adaptation of Daredevil. Duncan’s portrayal of a tough street thug playing as a gentleman was one of the more underrated aspects of that film, and D’Onofrio manages to put his own mark on Fisk. D’Onofrio plays Fisk as something of a lost child, emphasising how much of Fisk is rehearsed performance – and how much is raw desperation. There is something almost touching about how desperately Fisk wants to build himself a surrogate family. Wesley is more than a mere henchman, with the show presenting a genuine partnership between the duo. “Wesley is more than an assistant,” Fisk confesses to Vanessa. “He is my friend.” Wesley is entirely committed to his employer, to the point where he can even predict what Fisk might want before Fisk knows that he wants it. There is something undeniably tender in how Fisk acts towards those he cares about. While Daredevil is not entirely convincing in its attempts to parallel the two characters, it does a great job of mirroring their personal arcs. In the Blood parallels the developing relationship between Fisk and Vanessa with that between Matt and Claire; both women find themselves dealing with men who hold dark secrets and conceal dangerous urges. Nelson v. Murdock mirrors the disintegration of the relationship between Matt and Fogey with Fisk’s failure to protect Vanessa. The rest of the supporting cast is also great. Scott Glenn makes a memorable appearance in the episode Stick as a snarky father-figure for a boy who just lost his dad. Deborah Ann Woll does great work as Karen Page, even if her character arc feels less compelling than that given the material given to Charlie Cox or Vincent D’Onofrio. It is a shame that Rosario Dawson does not appear more frequently. Vondie Curtis-Hall is perfeclt cast as Phil Urich. The weakest member of the ensemble is Elden Henson, trapped in the bumbling “comedic sidekick” role as Foggy. It is quite clear that the writers on the show are big fans of Frank Miller’s work on Daredevil. there are a lot of little touches that reverberate through the show. Matt’s original costume and the early episodes’ fixations on human trafficking and child abduction feel like a shout-out to The Man Without Fear. Wilson Fisk’s fascination with Japanese culture is another allusion to Miller’s work, as is the none-too-subtle hints towards the Hand and Elektra scattered throughout the season. Even the early-season fixation on the importance of avoiding the name “Wilson Fisk” feels like an homage to a subplot in Miller’s Born Again. In that iconic comic book, reporter Ben Urich was brutalised and tortured to the point where he would not even allow himself to think the name of “Wilson Fisk”, thus protecting the crime-lord from investigation or prosecution. Fisk implements a similar policy among his underlings here; even his higher-ranking minions seem to avoid saying the words out loud. Daredevil is also populated with lots of references and acknowledgements of the wider Marvel Universe. In Nelson v. Murdock, Matt remembers defending the Roxxon corporation. In the same episode, Owlsley makes passing reference to Cornelius Van Lunt – the villain who would become the financier of the original “Zodiac” group. Urich’s wall is adorned with headlines referencing the “Harlem Terror” from The Incredible Hulk and the “Battle of New York” from The Avengers. It is an approach that does not require the viewer to be intimately familiar with comic book minutiae, but does provide a nice backdrop for the story being told. Indeed, it might account for the fact that Daredevil seems to be set in a version of Hell’s Kitchen that was not gentrified during the nineties; it seems weird that Matt and Foggy frequent a dive bar, when there is probably an organic bagel shop right next door. Daredevil is grounded in the version of Hell’s Kitchen that existed in the seventies and eighties. This means that a lot of the potential issues facing Matt Murdock can be swiftly side-stepped. There is a reason why Matt can’t trust the authorities to investigate Fisk, and there is a reason why he (and we) should not feel guilty when the cops find themselves going up against “the Devil of Hell’s Kitchen.” If Matt were facing legitimate law-abiding police officers, there would be a lot more conflict and ambiguity. Placing Matt in an absurdly corrupt world fits the tone of the show, but feels a little easy when it comes to plotting his character arc. Daredevil is a fascinating accomplishment, even if there are a few problems here and there. It is perhaps most interesting in what it promises for the road ahead; having spent thirteen episodes setting up all these plot elements and character arcs, the production team have the opportunity to build upon and develop them. Although Daredevil is no small accomplishment in its own right, it is perhaps most successful as a promise of what might be yet to come. Well, the individual episodes are coming in at a rate of about one-a-day. I’m actually reasonably happy with how they turned out. I might try this with the other Netflix shows, as I’m not sure I have the energy for a full twenty-odd episode season of Flash/Arrow/S.H.I.E.L.D. I’ve been reading and digging the individual episode reviews as soon as you’ve been posting them, so good work on all that. Since you might have jumped in a little too late for Arrow or Flash (the latter of which has had a really strong first season in my opinion) have you given any thought on Agent Carter? That series was only eight episodes. I am actually woefully behind on all sorts of commitments. It has… not been a good month for me personally. At this rate, it looks like there might need to be a breather month to catch everything up, or – at the very least – some slowing of content. U left out Ben Urich’s demise. I tried to keep the spoilers vague. But I do go into depth on that in my review of The Ones We Leave Behind. This being Batman, of course the former would be overshadowed and moved off-stage by the latter. But part of the reason I’ve been waiting years for a good Daredevil adaptation is that with a nemesis like the Kingpin, he’s in a good position to tell that “Zorro/Robin Hood superhero tries to clean up his city” story and do it justice. I’m still a few episodes from the end, but so far it’s doing it pretty well.